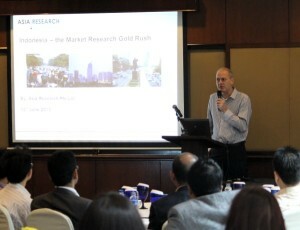 Asia Research held its Jakarta Breakfast Seminar, “Food for Thought” at the Gran Melia Hotel on 13th June 2013. 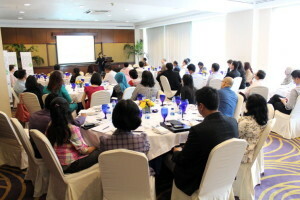 Attended by around 60 market research professionals from both client organisations and agencies, this was the first breakfast seminar to be held by Asia Research in Indonesia and also the first seminar to be held outside of its home market of Singapore, where seminars have been staged since 2011. 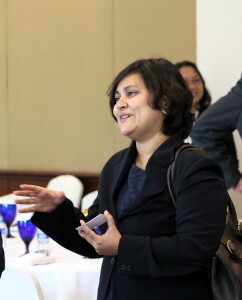 Asia Research has attracted much interest from Indonesian research professionals. 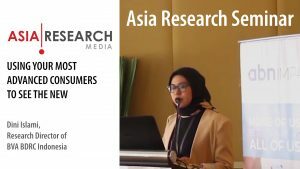 Along with Singapore, Asia Research runs the annual buyer survey in Indonesia and as the second highest source of visitors to Asia Research Online, Indonesia was seen as the obvious location for its first overseas seminar. Sponsored by Toluna and Kadence, clients attended from a range of industries including banking, FMCG, media, and pharmaceuticals; the agencies represented were mostly from the independent firms within Indonesia with some flying in from neighbouring Singapore. The papers presented included 1) an overview of the market research industry in Indonesia, 2) the principles behind semiotics, and 3) the complexities of food palates among Indonesian consumers. 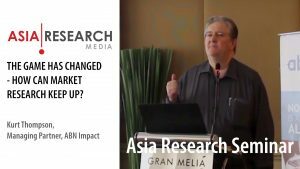 The overview of the market research industry was presented by Piers Lee from BDRC Asia, a regular writer on how the market research industry in Asia is evolving. The paper reported on the recent survey of around 100 market research buyers in Indonesia, and how this compared to the parallel survey conducted in Singapore. More details on this survey can be seen in the Special Report. Titled “Indonesia – the Market Research Gold Rush”, the paper demonstrated that the spend on market research in Indonesia had almost doubled in the last 5 years and based on ESOMAR statistics, since 2008 the country has moved from 44th in the world’s spend on market research to 28th today. Looking at expected GDP growth for Indonesia over the next 5 years it demonstrated that this rate of growth will continue both because of GDP growth and the fact that the market is still playing catch up with others. The irony though was that while the paper talked of ‘the gold rush’, the reality is that many research firms, particularly those outside of Asia, do not even think of going into Indonesia. Instead they choose the move obvious destinations of Singapore, China, and India – markets that already cheap avodart canada have overcapacity in market research and in the case of Singapore might even be getting smaller. The second paper from Alina Shrivastave from ID Stats, demonstrated the important role of semiotics in market research. With many market research firms implementing standardised survey research techniques across the region, semiotics (which is often overlooked in consumer studies) is viewed as the “other part of the equation”. Semiotics overlays the cultural context within market research – it does not ask survey respondents anything different, but the application of semiotics helps brand owners and marketeers refine their campaigns based on cultural norms, taboos, existing trends and fads, and even fashion and architectural tastes within markets. The case studies presented identified how brands can help to differentiate themselves emotionally, e.g. towards deeper relationships with customers. 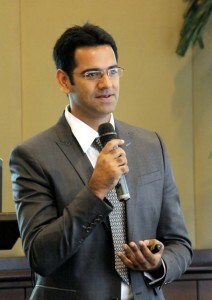 The example from India showed how mobile ethnographic techniques were used in a survey to let consumers upload photos and record their thoughts in unstructured ways. These were then ‘decoded’ by the researcher as metaphors for what the consumer is really thinking about how they interact with products. The final paper from Kadence highlighted the lack of customization of products that prevails within the huge market of Indonesia. While manufacturers do customise their marketing activity for different countries and consumer segments, only 50% of product test surveys in Indonesia include representation of consumers outside of Jakarta. With the population of Indonesia approaching 250 million (the 4th largest in the world), 75% of manufacturers’ sales within Indonesia are actually achieved outside of Jakarta, and yet only half the product tests conducted in Indonesia include these other locations. Consequently most clients end up having just a single product or formulation for the whole of Indonesia even though they usually maintain multiple factories throughout the country where customization at a site level would be possible. The ‘changing food palate among Indonesian consumers’ showed that not only do tastes differ across the nation, but over time consumers are looking for different palates, e.g. lower sweetness levels which is partially influenced by higher awareness of health issues. 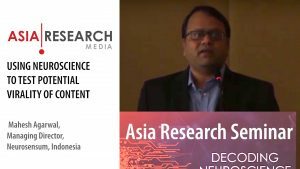 Asia Research will look to make the Jakarta breakfast seminar a regular annual event, but with significant circulation across the region, we would also be keen to hear from research firms looking to hold similar seminars in other parts of Asia.